Overnight care is an option for those who are recovering from surgery, an injury, or a period of hospitalization and may need assistance throughout the night. Overnight care is also an option for individuals who sleep through most of the night but may require occasional assistance. Our trusted caregivers can provide evening or overnight care to allow you or your loved one to remain in the safety and security of home. Seniors on Site caregivers are even available to stay for days at a time, allowing the client enough recuperation until they can manage safely on their own. 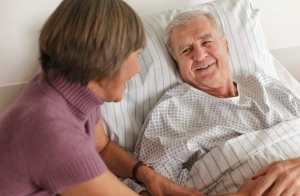 After surgery or hospitalization, there can be a great benefit to having someone by your side to help out at home and provide you with assistance. If the circumstances call for it, our caregivers are able to go participate in the patient’s discharge right at the hospital so that they can easily become familiar with any post-operative requirements. This can help increase the overall effectiveness and quality of care. If you or a loved one currently need or anticipate the need for overnight care, give us a call to inquire about your particular needs and requirements and to find out how our caregivers would be able to help.